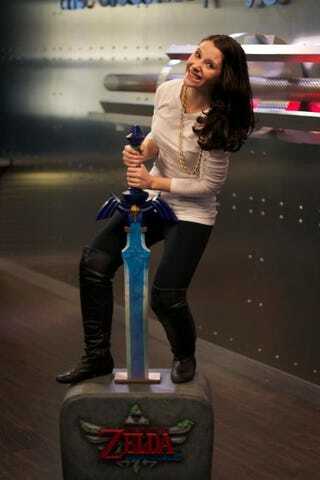 Nintendo Sent Her Link's Master Sword and a Stone. But She's Not Link! This is Briana McIvor, one of the hosts of video game TV show Electric Playground. She's trying to pull a fake sword from a fake stone. Who could resist? The sword is a big Zelda promotional prop intended to hype the November release of The Legend of Zelda: Skyward Sword. Hey, it worked!